Millennia ago, the Gods and humanity turned their backs on one another. Zeus sealed off Olympus from the mortal world, forbidding any Gods to set foot on that plane — with two exceptions. The Gemini, the twins Castor and Pollux, straddle the worlds, maintaining a tenuous balance by hunting down fugitives from both above and below. For the most part, the boys like the gig: beautiful locales, adventure, baddies to beat up, the occasional beautiful woman (or Goddess). And so long as they die by the end of each year, their pact with Zeus remains intact, and they are reborn with the new year. But something goes wrong after their latest hunt. The portal to Hades remains open just a moment too long, and something terrible crawls out — something with the power to kill Gods …. 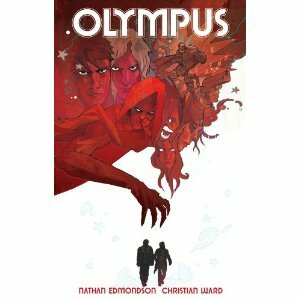 I missed the original four issue miniseries of Olympus when it was initially released, so I was very happy to find this compilation. In addition to the original four issues, there are also introductions by Bryan JL Glass (creator of The Mice Templar) and Edmondson; a short back-up story; and a host of guest and alternate covers. Edmondson’s story begins with a bang (quite literally) as the twins kill one another at the end of the year. The tale then immediately jumps back eleven months, when we find Castor and Pollux in pursuit of Hermes, who has fled Olympus for Earth, his stolen caduceus in hand. The twins are (moderately) sympathetic when Hermes explains that he needs the staff to grant immortality to the woman that he loves. But they are more interested in doing their job and, after a mad chase across rooftops, through the air, and on the back of a careening motorcycle, they finally snag Hermes. That snagging bit is actually pretty cool. The hook goes in the God, the pin on the end of the chain goes in the ground, and Hades pulls the renegade Deity through a gaping hole and into exile in the underworld. Unfortunately, Castor and Pollux don’t stick around long enough to make sure that the hole closes, and out crawl Pelops and the Harpies. Pelops immediately sets about killing the four semi-divine daughters of Demeter, one by one. As the daughters die, the seasons and weather begin to go crazy. The twins finally corner and confront Pelops and the Harpies and, with the grudging help of Hermes, save Summer and send Pelops back to the underworld. Overall, a fun and fairly straightforward plot. Occasional flashbacks explain the twins’ origins and ancient adventures (most notably with the Argonauts). The best parts of the story are one) the relationship between Castor and Pollux: they argue and fuss and gripe, but they are completely devoted to one another. They will always be there for one another. And two) Pelops. He may be the villain, but you end up feeling sorry for the guy. Didi (aka Daedalus) is also an interesting character, though we don’t see much of him and get none of his background. Ward’s artwork is kinetic, sketchy, scratchy and colorful. If I were to hazard a guess, his chosen media are watercolor and inks. Ward’s art style matches Edmondson’s story quite well. More often then not, Ward abandons the traditional sequential panel format in favor of a much more organic style, with images and colors running into one another. Oftentimes, a single color in differing shades will dominate a sequence; for instance, when Pollux finds Winter, blues and grays fill the page. Ward’s art is also filled with fun visual bits. Didi’s secret headquarters/lab includes a miniature labyrinth; a nice homage to one of his most well-known accomplishments. Cityscapes feature buildings modeled after the classical architecture of Greece. And so on. I do have a few nit picky problems. For one, Pollux is actually the Roman name of that demigod. I’m guessing that, even though Edmondson employs the Greek pantheon and mythology in this tale, he thought that the original Greek Polydeukes would be too odd and difficult for modern readers. Secondly, a few plot threads are left dangling: who was this mortal woman whom Hermes loved, and what became of both of them? Why was Hermes going by the name Grigori? How did Castor and Pollux meet Didi, and why is he still around? I was also disappointed that the descent of Demeter to the mortal plane, following the murders of two of her daughters, was not shown at all; it was only alluded to as happening off-panel. Uh, okay …. Did she descend from on high in all Her divine glory, with CNN helicopters buzzing around? Does anyone else know that She’s back and that, even more importantly, all those old Gods really are real? Hopefully, a few of those questions will be addressed in the next volume. I can see Castor and Pollux taking on all kinds of different mythological baddies …. Recommended to fans of the the graphic novel series Artesia; the television series Supernatural; and Donald Richardson’s Hercules and Other Legends of Gods and Heroes.